The Manifesto Club is supporting members of the Palestinian Solidarity Campaign, who have been prevented from handing out leaflets in Woking Town Centre. They were told that they must gain prior approval from the council, and submit the leaflets they wish to distribute. They were also told that they must get public liability insurance before distributing leaflets. Both of these requests are based on the council’s Public Realm Usage Policy. Both are also entirely unjustified, and have no legal basis. 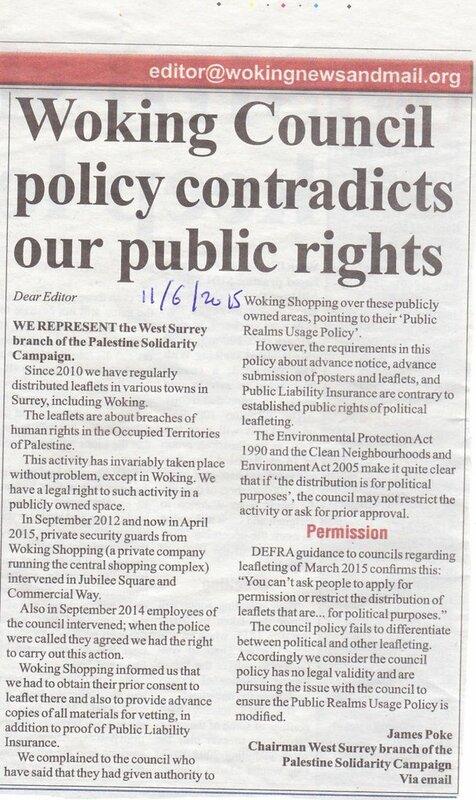 Members of the group wrote a letter to Woking News, outlining their position (see the letter here). We wrote a letter to Woking councillors in support of the group (see this below). We hope Woking Council will take the opportunity to revise their ‘Public Realms Usage Policy’, recognising that the town centre is a public space for the free use of members of the public, rather than a corporate or official space to be managed by council leaders and business bodies. I am the director of the civil liberties group the Manifesto Club (www.manifestoclub.com), and am writing in response to your ‘Public Realms Usage Policy’, particularly the impact this is having on the right of members of the public to leaflet in Woking town centre. My organisation has researched the question of leafleting regulation (http://www.manifestoclub.com/leafletingban), and recently we worked closely with Defra in order to produce new guidance to councils on the use of powers to restrict leafleting (https://www.gov.uk/council-powers-to-control-leafleting-causing-a-litter-problem). The legal situation is quite clear: there is only one legal basis for councils to regulate people’s distribution of leaflets in public spaces, which is the Clean Neighbourhoods and Environment Act 2005, an amendment of the Environmental Protection Act 1990. However, this act clearly exempts all leafleting of a political, religious or charitable nature. By any interpretation this exemption would include the leafleting carried out by the Palestinian Solidarity Campaign, who were recently prevented from leafleting by your officers and private partners. DEFRA Guidance to Councils regarding leafleting of March 2015 states: ‘Freedom of speech is important. You can’t ask people to apply for permission or restrict the distribution of leaflets that are…for political purposes’. It may be that you would like to run a ‘town centre diary’ in order to coordinate large-scale leafleting, which runs on a purely voluntary basis. However, this cannot be made obligatory: you cannot ask leafleteers to register or submit their leaflets as a condition of their leafleting, and you cannot prevent them from leafleting on the basis that they have not registered. If the leafleteers are being aggressive, obstructing the highway, or handing out material that is contrary to public order law then of course the police can disperse or prosecute them. But if they are conducting themselves in a law-abiding manner, there is no legal basis for preventing them from leafleting. I understand that the Palestinian Solidarity Campaign were additionally asked to obtain public liability cover. Again, you may recommend to groups that they obtain insurance cover, but this cannot be insisted upon as a condition of handing out leaflets in the town centre. I do hope that you will consider these concerns. I am sure your policy is well-intentioned but I am afraid that it is without legal basis, and therefore that the ensuing restrictions upon public activities are both unjust and unjustified. I believe that you are reviewing your policies in this area and so I hope this might be an opportunity to reconsider. We will be following this case with interest and will offer support and publicity to the campaigners if they would so desire. I would be happy to discuss this issue with your officers if that would be welcome and helpful.